Dark chocolate, Oreos, vanilla sea salt. A brilliant combination. One first introduced to me by the (clearly) genius Michelle at So Wonderful So Marvelous. 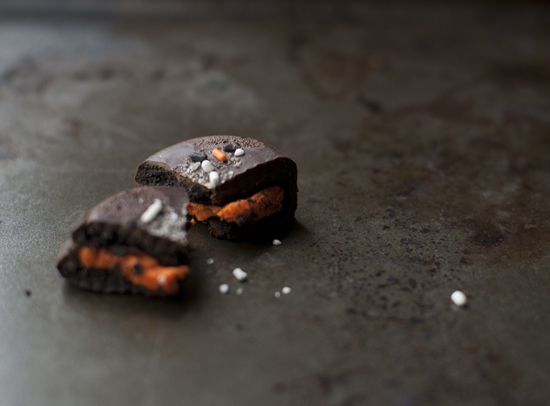 I came across her Sea Salt Chocolate Covered Oreos a year or so ago and now can never imagine my life without these deceptively decadent treats. It’s like they’re my secret little escape. The vanilla sea salt hits your tongue and dances around with the bitter sweet dark chocolate which offsets the super sweet Oreo cookie inside. Amazing.If you’re wondering where to get vanilla salt, I have used Fusion brand and it can be bought in Toledo at The Anderson’s or on Amazon. If you get a bit of sticker shock (the stuff isn’t cheap) you can make your own, by adding a few drops of vanilla extract to some sea salt, stirring it around and allowing it to dry a bit before using. Extra vanilla salt can be used on super fudge-y Salted Caramel Brownies. 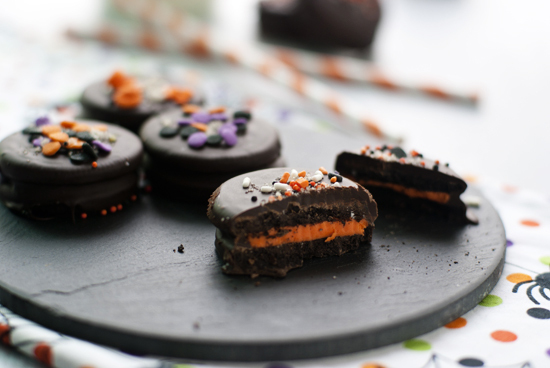 These Oreos have become my go-to treat for parties, school and the occasional Tuesday afternoon. My kiddos love to help me make them so it’s a treat for everyone. I dip the Oreos and they sprinkle the salty/sprinkly goodness on top. It’s like a little assembly line of heaven. As a complete bonus, they are nut and milk allergy friendly! With the Baby’s peanut allergy, and my nephew’s nut/milk allergies these are a great alternative for a party treat. As long as you use chocolate that is milk free-which many brands of dark chocolate chips are. Originally, in Michelle’s post, she made a super adorable Valentine’s Day version. I have found that these can be easily customized to any holiday by simply adjusting the Oreo type and sprinkle topping. I dressed this little batch up for Halloween. For the Baby’s birthday party we made ‘Berry Burst’ and ‘Mint’ versions with pink and green sprinkles on top. 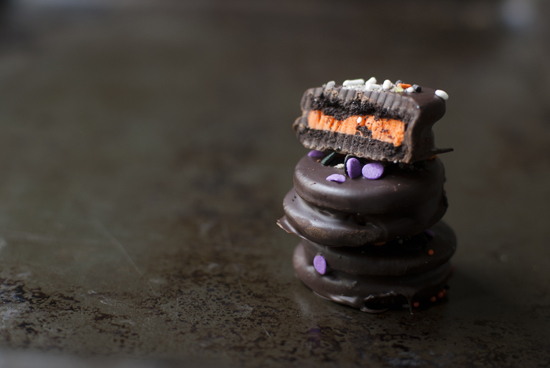 No matter what type of Oreo you use or for what occasion you make these, you can’t fail. Simple yet perfect every time. Place chocolate chips in a microwave safe bowl. Microwave chips on high for 1 minute. Stir chips. Microwave an additional 30 second increments if needed to melt the chocolate, stirring between each interval. Place 1 Oreo in bowl with melted chocolate and, using a fork, turn and thoroughly coat the cookie. 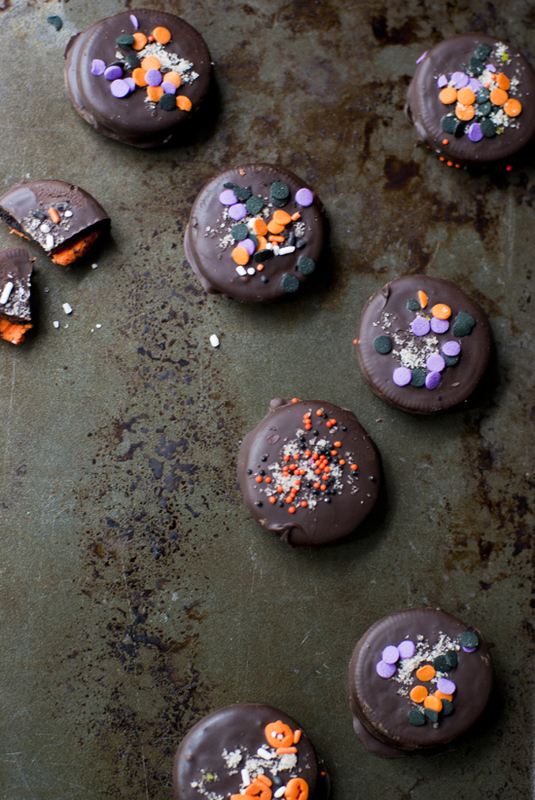 Tap off any excess chocolate and place cookie on the prepared baking sheet. 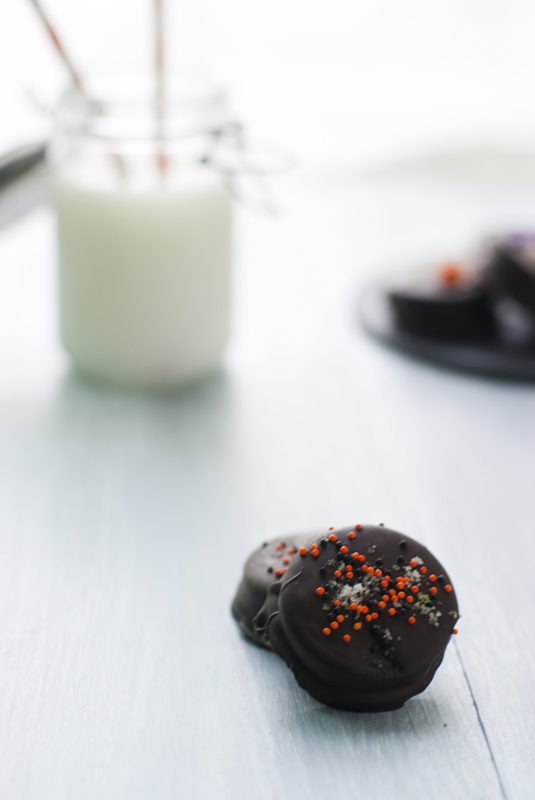 While the chocolate is still melty, sprinkle with a pinch of sea salt and sprinkles. Refrigerate cookies until chocolate is set. Layer cookies between sheets of wax paper and place in an air tight container in the refrigerator for up to 5 days. Yes! I find myself making them for literally any occasion I can come up with. Thanks for stopping by and saying hi!